Featuring numerous instrumentalists, singers and percussionists, Da-Saz is a collective formed in 1999 in New Delhi by Lionel Dentan and Suchet Malhotra. 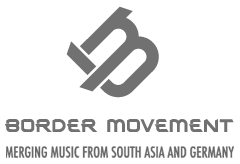 It aims to create a platform for new styles of urban and traditional music through live performances and recorded albums. Jet Lag was a project started in 2004 with the idea of creating a bridge between different cultures and musical poles viz orient-occident, electro-acoustic, maximal-minimal…..
Envisioned as an eclectic combination of sufi, Punjabi folk and poetic lyricism interlaced with electronic beats and harmony, Jet Lag is one of the most progressive Da-Saz projects till date. Jet Lag features the far-reaching vision of Lionel Dentan (synth, computer & strings), the vocal prowess of Dhruv Sangari, the virtuosity of Gennady Lavrentyev (violin, guitar & arrangement), the percussive imagination of Suchet Malhotra and the engineering genius of David Scrufari (composition & mixing).